Embrace the craggy green silhouette of the Pyrenean mountains and notice how the landscape gradually changes to gentle undulations as it descends to the fertile river plain known as “la Ribera”. Smell the aroma of ancient traditions along the Way of Saint James, on the route from legendary Roncesvalles to the city of Viana. Thrill to the colourful local festivities: the bull-running in San Fermin and numerous summer fiestas take place amid a sea of red and white. And don’t miss the wide range of gastronomic treats on offer, including top-quality meat and fresh vegetables from the farmlands on the Ribera river plain, accompanied by the region’s excellent wines. Navarre’s most important traditional events include its various religious processions, pilgrimages like the Javierada, the festival of the almadías (traditional barges for transporting logs), witches’ covens, the San Fermin bull-running festival, hunting, and Carnival. 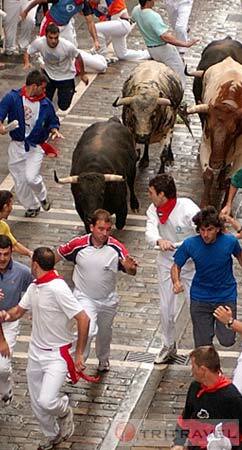 The greatest of all festivities takes place in Pamplona. The firing of the traditional “chupinazo” or firecracker on 6 July marks the start of the festival known as the “Sanfermines”, when everyone is caught up in the explosion of camaraderie and high spirits which fills the streets throughout the fiesta.